I was first impressed by CLOUT! at the sadly-now-on-hold Offset Festival last year, but then heard nothing about them for a while. And I suppose that’s not surprising, as they've just put out their first release, and have also ‘withdrawn from gigging’ to concentrate on honing their sound. What would there have been to hear about? It turns out CLOUT! were actually formed four years ago, so they’ve had plenty of time to hone. It seems to have paid off. Formed in Southend, recently somewhat of a musical hotbed thanks to the endeavours of The Horrors (whose Tom Furse provides one of 4 remixes on the 7 track EP) and These New Puritans, their eponymous EP recalls the atmosphere and mood of those two bands, all dark and brooding. As well as this, CLOUT!’s percussive elements seem to draw on those of These New Puritans’ 2010 record 'Hidden', with similarly inventive experimentation, and whilst they are a bit more lo-fi they are no less exciting for it. The music seems also to draw inspiration from dubstep, with super deep throbbing sub-bass, particularly on 'It’s Too Late'. CLOUT!’s tracks are melodic, with plaintive vocals and unidentified noises rising and falling in and out of swirling soundscapes. Hopefully it won’t take them 4 years before their next release, because there are an awful lot of interesting things going on in their music. 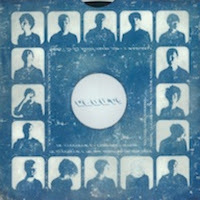 Purchase the CLOUT!’s debut EP in mp3 format from amazon.co.uk or on 12" vinyl from Dirty Bingo. Pick up a free download of one of the remixes above.